WeatherCall has been delivering phone calls, emails and SMS-Text messages since 2007 giving subscribers the best and fastest emergency weather notifications available today. Over 7 million WeatherCalls have been made and is PROVEN to SAVE LIVES in some of the nation's worst tornado outbreaks since 2008. This proven life-saving service is now available as a fundraiser with aggressive returns for your organization. Assigns a precise latitude/longitude to an address, and allows ups to 3 phone numbers and email addresses. Delivers warning message ONLY when the location falls INSIDE an official warning area, eliminating false alarms. Subscriber chooses the type of warnings they wish to choose from: tornado, severe thunderstorm and/or flash flood. Works with ANY type of telephone – old analog hard-wired rotary dial types to digital smart phones. Registration can be online, by mail, or via a toll-free messaging system. Uses an IPhone or Android smart phone "self-locating" capability, notifying user of nearby official warnings to wherever the phone has traveled. Delivers phone message and/or SMS text plus 1 touch detailed map of the warning area. "All Clear" notifications when warnings are no longer in effect. Lightning notification available for those monitoring outdoor lightning threat. Download the WeatherCall Fundraising Program Agreement HERE. After you fill it in and sign it, you can either scan it and email that agreement back, or fax it to (815)301-8719. If you request brochures make sure to give us a realistic number you will actually use and we will provide them to you. Remember, you can successfully launch thus using the links we will provide you to sharable PDF files and sign-up links! Distribute the WeatherCall Fundraising Program web link assigned specifically for your organization through your students, parents, web-pages, social media, etc. Consider holding an assembly to explain the program to students. Parents and students introduce WeatherCall @Home or WeatherCall ToGo subscriptions to family, friends, neighbors who want to support their school program. Subscribers go to assigned web-page set-up specifically for your organization and go through the sign-up process for whichever services best fit their family members' needs. To complete the registration process, WeatherCall uses a PayPal payment page where either a PayPal account or major credit card can be used. We do this to ensure security of the subscribers' private information. You can choose to receive a report either monthly or quarterly with the total subscriptions sold and a check. Your program receives $5.00 back the first year for each WeatherCall @Home or WeatherCall ToGo subscription sold. If the subscriber renews their subscription, you will receive a $1.00/year renewal reward for as long as the subscription remains active. Recent improvements in how the National Weather Service (NWS) defines warning areas have resulted in significantly higher accuracy and smaller warned areas, compared to the decades-old county-wide warning method. Learn more about NWS storm based warnings by clicking here. The WeatherCall system continuously monitors the National Weather Service's NOAA weatherwire. Using computerized mapping (GIS) the system compares a subscriber's specific location to the location of the warning area. When a severe weather warning includes your location, you will receive phone calls from WeatherCall, 24 hours a day. You can also receive the warning by email with a detailed map of the threat and/or by SMS text messaging. During recent tornado outbreaks from 2011 and 2012, WeatherCall delivered virtually flawless warnings beating all competitors in timeliness and accuracy. At WeatherCall we believe a late warning can be worse than no warning at all. It can lull someone into a sense of security. If they think they are protected, hear a storm, and don;t get the notification they expect, that late warning could cause injury or loss of life. At WeatherCall, we take our calling seriously and are always monitoring our system to assure against late warning notifications. 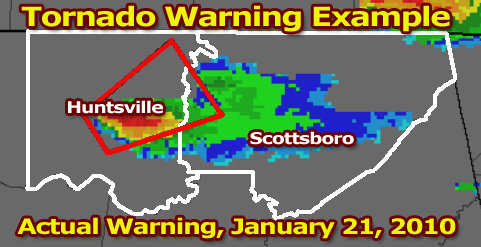 Madison and Jackson Counties' combined 1,885 square miles are under a tornado warning issued on Jan 21, 2010 at 5:30pm. The true warning area is slightly more than 300 sq. miles, representing a 85% reduction in warned area. Only WeatherCall subscribers INSIDE the red box would receive the warning call. Traditional Warning methods include NOAA weather radios, which are county-wide. That means that everyone in both couinties would be warned even though only about a 15% area of both counties are actually in the warning. Most counties' outdoor sirens are also based on county-wide warnings, which means that even though 100% of those hearing traditional warnings through NOAA weather radios and outdoor sirens, only 15% of them are in the warned area. That is how precise WeatherCall is. Over half a million users depend on these precise warnings from WeatherCall. ASK FOR THE AGREEMENT AND TAKE PART IN THIS AGGRESSIVE FUNDRAISER TODAY!